HOME > ABOUT US > Announcements > Take the AM Personal Umbrella Challenge! 1. A&M must have declined in writing to quote the risk after you have submitted an application and supplied all requested additional underwriting information. 2. You must send to A&M a copy of a binder or declarations page for a Personal Umbrella policy insuring the declined risk. 3. The binder or policy must be issued by an insurer admitted to do business in the state where the risk is located. 4. The effective date of the Personal Umbrella policy must be effective after the date that A&M declines to quote the risk but not more than 90 days after the date A&M issues the declination. 5. This offer good on risks declined by A&M prior to July, 1st 2017. 6. This offer may be modified or rescinded, at any time and without notice, at the sole discretion of A&M. 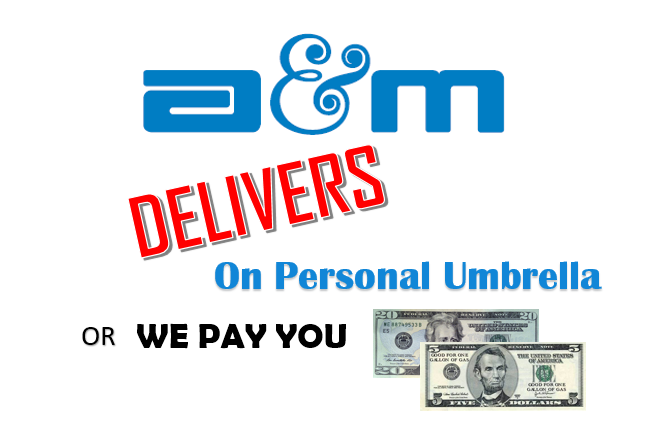 For more information about A&M’s Personal Umbrella program, click here.